I’m sitting back on the bed in the foster room, propped up against a few ratty old pillows. Foster kitten, Mighty Macaroon (Mac for short), is sitting high up on my chest, purring loudly, rubbing her face against my cheek. Her nose is wet. It makes me squirm. One at a time I can feel the tip of one of her claws extend, then retract, extend and retract as she flexes her toes. It hurts. I realize Mac is overdue for a claw-trim, but I can’t get to it right now. I’d rather sit here and stare at the TV while she makes tiny pinholes into my skin. Being in this room is my escape from what is in the room below me, Spencer, laying on the heated bed, wheezing ever so slightly as he sleeps. He’s doing all right, right now, but I don’t want to think about what may or may not be inside his abdomen. It’s the night of Thanksgiving and I am not thankful for anything. I’m just tired and angry and scared. Getting lost in a TV show is my escape. 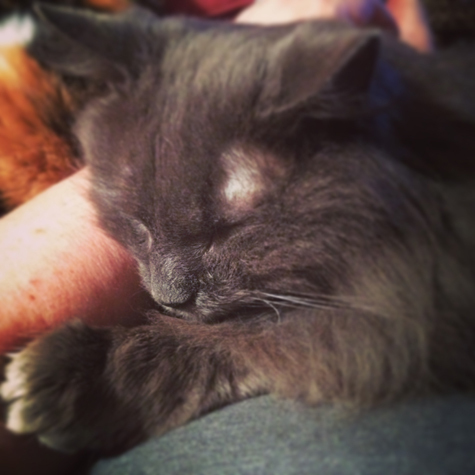 A healthy, purring kitten makes me forget about the senior who is not, even if my escape only lasts a little while. I haven’t been going for my walks. The pain in my knee is too much. I’m not eating well. I know I’m gaining weight. After all I did to drop over 50 pounds, my fear of it coming back is likely to be realized. The stress is too much. I should probably start boozing it up or taking anti-anxiety medication or running away from home and getting myself into more trouble, but I also know I can be strong. I can face these things I fear most and I can fight to protect my loved ones. Maybe I just need a break and “hiding” in the foster room is as much as I’m allowed. Dr. McDaniel reviewed Spencer’s case with us. As often happens, though we did have needle aspirate results, they only pointed to the likeliness of it being carcinoma, but it was not definitive by any means. There are times when you must know what you’re dealing with, but many times it’s a gray area. ©2017 Robin AF Olson. 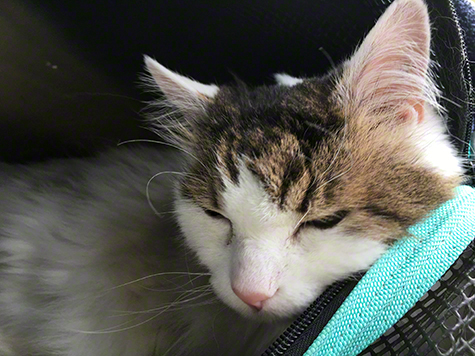 Resting on the way home from yet another vet visit. In Spencer’s case, it’s becoming more clear that we need to know for a variety of reasons. 1. Surgical removal of the mass. Have it biopsied. Examine the pancreas, liver, kidneys, etc and biopsy or remove the liver lesions if appropriate. We would have to talk to the surgeon, Dr. Weisman, to get more details on how this would happen. 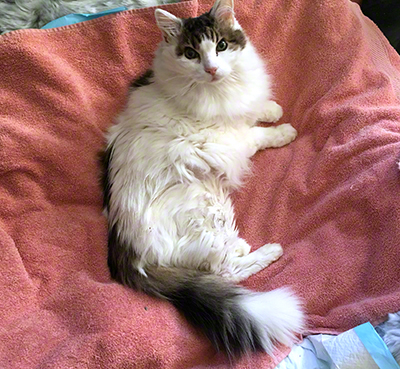 Being that Spencer is 15 and has kidney disease and is cranky are all factors to consider. That said, it's likely that removal of the mass could extend Spencer’s life a YEAR or more if we follow up with some sort of chemo. 2. Chemotherapy administered in the hospital via an IV. This is not an option for Spencer because of how fractious he is so we didn’t discuss it much. She did add that this sort of chemo might not give us much of a different result than her third option. 3. Palladia®. It’s a relatively new therapy for dogs with mast cell tumors. Apparently it can work very well on different types of cancer and that cats can tolerate it well. It does have some scary, hopefully short-lived, side-effects. 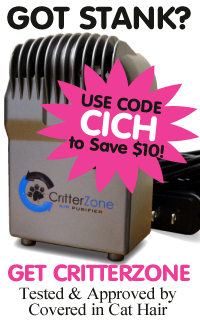 It can possibly stop tumor growth and reduce the size of any existing tumor. The pill is given 3 times a week at home and it would require a monthly vet visit to check blood work. 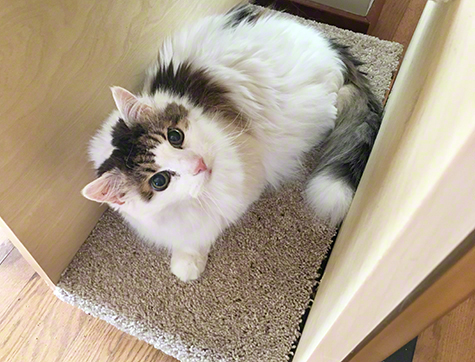 Dr. McDaniel has had good results with it in cats and feels like it could be beneficial for a time. We could skip the surgery and just go to Palladia, BUT ONLY IF SPENCER HAD A GOOD response to the chemo. He might get 6 months or so. 4. IF Spencer is a good candidate for surgery, the best result we could get would be surgery plus Palladia, or potentially another drug, given at home once we have biopsy results post surgery. That way we could target the medications to what sort of cancer Spencer has. Spencer has a weird cough. It started early in the autumn. I thought it was seasonally related and mentioned it to Dr. Larry. He said we’d explore that when I brought Spencer in for his 6-month recheck in December since Spencer wasn’t in distress. Since we didn’t get to do that and I mentioned it to Dr. Mary, she did see something on Spencer’s x-ray. Dr. McDaniel saw the x-ray, too and wanted to get a better angle on Spencer’s chest because she was concerned there was a mass behind Spencer’s sternum. Dr. McDaniel explained that there’s a lymph node in the area of concern and it could be inflamed. Though odd to imagine, that lymph node is responsible for draining fluid build-up in the abdomen. So, it would make sense that this could be lymph involvement instead of cancer. Could we do another x-ray? It would mean Spencer would have to be lightly sedated again. Knowing that a mass in Spencer’s lungs would tell us the cancer had metastasized, would also mean it wouldn’t be worth considering surgery. We’d have been too late in the game to try so I agreed it was worth getting a second look at his chest. Spencer was none too happy about it, but thankfully they were able to get a good image. Dr. McDaniel wanted a radiologist to review the image and give us a report. It was the cusp of the holiday so she was hopefully she’d have news that afternoon, but it wasn’t a sure thing. Once again it was time to play the waiting game. Every time Spencer coughed or swallowed awkwardly, until we got the report, I wondered if it was a mass. We brought Spencer home to recover. He was really hungry and it was comforting to see him chow down. He bounced back from the sedation very well, but meanwhile I was left to wonder where the update was and why I wasn’t getting any news. ©2017 Robin AF Olson. Snack time. I love Spencer's spots. Of course…the holiday craziness…so I waited…Friday passed, Saturday, Sunday…I called and left a message for Dr. McDaniel to call me. I found out she didn’t return to work until Tuesday. I called to speak to Dr. Mary and found out the same thing. I was resigned to waiting another day, but it was killing me. Monday night, Dr. Larry called. He’d gotten the report and said the radiologist felt it was not neoplasia (cancer), but normal geriatric changes. Though it seemed to be good news, he warned me that sometimes he’s pushed back on a report and got different results. He said that it still could be cancer and to talk to the oncologist about it again. On Tuesday, Dr. McDaniel called and left me a message. She was bright and upbeat. No cancer in the lungs. All was well. I was hesitant to be happy about this news until I heard the rest of her message…she’d asked her colleague, Dr. Porter, who is the Emergency & Critical Care Specialist, as well as our surgeon, Dr. Weisman, to look over Spencer’s x-rays. They all agreed it was geriatric changes, NOT cancer. Maybe there was some light at the end of the tunnel? Our next steps, she suggested, would be to talk to Dr. Weisman about surgery if we felt that was an option for our boy. • They open him up and find he’s full of cancer. They’d put him down right then and there. Could you live with that? • What if he doesn’t survive the surgery? • What if he dies shortly after the surgery? • Why not just do the chemo at home and make your peace with it? It’s certainly more affordable and less stress on everyone. Yesterday we met with Dr. Weisman. 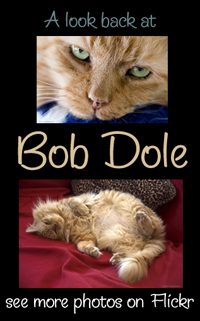 She’d done surgery on our boy, Bob Dole, five years ago. Last year she saved Annie’s life when we discovered she had an intussusception and needed a portion of her intestines removed and stitched back together. I trust Dr. Weisman completely. She doesn’t sugar-coat anything and is a straight shooter. I like and respect her very much. She has the skills and is Board Certified. If someone was going to cut Spencer open, I’d want her to do it. Before we arrived at our appointment, Sam and I spoke about what to do for Spencer. One vet said not to do the surgery and just do Palladia, but what if Spencer didn’t have a good response to it? What if it wasn’t the right treatment for his type of cancer? We wouldn’t know what we were dealing with so we’d waste resources trying this and that. Spencer’s been doing well at home. He brightened back up. He’s eating. He’s grooming himself. He even played a little bit a few days in a row. If we’re going to do this it has to be soon, while he’s strong. Also, the mass is large and it must make him feel uncomfortable. Is it fair to Spencer to let him live out the rest of his life feeling uncomfortable with a mass inside him? I was thinking maybe we shouldn’t do surgery, but I changed my mind once Dr. Weisman filled us in on what she was planning on doing and how she felt things might transpire. Then she blew my mind telling us something I didn’t even want to hope for. She reviewed Spencer’s records and even with his age and kidney issues, she felt he was a good candidate for surgery. She does these mass removals, literally EVERY DAY. What a sobering fact that cancer is on the rise that a majority of her surgeries are mass removals. She says pets are living longer so it’s natural they would get cancer. I’m not sure I agree with that, but the bottom line is, she has a great deal of experience doing what she called an exploratory surgery on our boy. Dr. Weisman would open Spencer up and assess the situation, then quickly come up with a game plan. She described some masses as being a simple blob with lots of fine tendrils hanging off it. It’s really easy to remove that type of mass and get it biopsied. It takes all of 15 minutes. The question is, in Spencer’s case, there are concerns that the mass is connected to a portion of his pancreas or his bile duct. ©2017 Robin AF Olson. You want to do WHAT to me? Dr. Weisman explained that she could remove the ends of the pancreas but that depending on how it was connected to the mass, she might not be able to remove anything. She would, of course, biopsy the mass so we could target treatment more appropriately. We’d also know what else is going on with his intestines and the lesions that were seen on ultrasound. 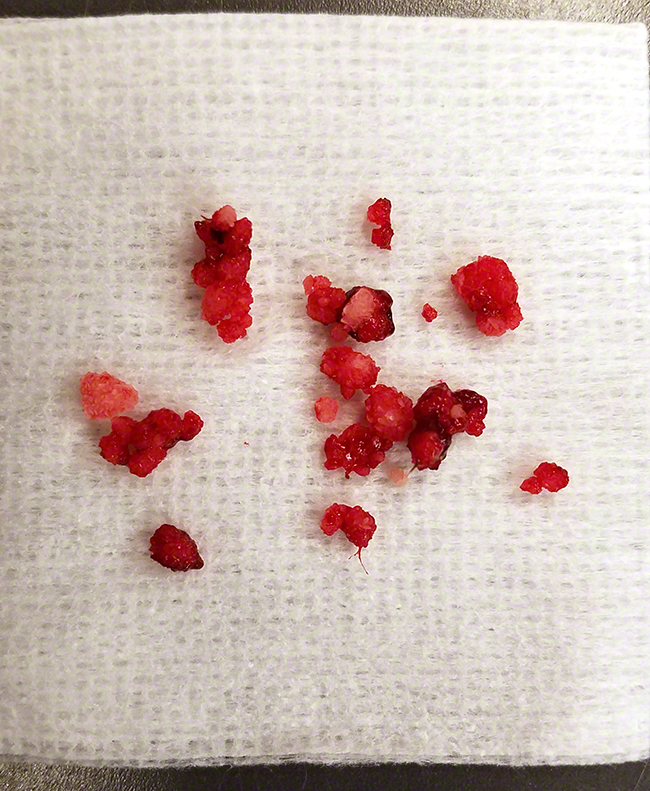 Whatever needed to be removed, would be removed and/or biopsied. I asked about her putting Spencer down during surgery if he had a belly full of cancer. She said there was NO WAY she was going to do that. Even if he did have cancer all over, since he was doing well at home, he could come home and we’d still do chemo and give him more time. We’d just know we probably wouldn’t have as much time as we had hoped for. I asked about him surviving the surgery and her assistant said 95% chance, which is pretty normal of most surgeries. I asked about protecting his kidney function and they would do everything they needed to do to make sure his kidneys didn’t get worse, but, like anything else, we don’t know 100% how his kidneys will respond. In my mind they’d just be more fluid filled and flushed out so in theory Spencer should not feel any ill effects from that. The bottom line was that Dr. W. felt Spencer was a good candidate if we didn’t wait too long. We could take a few days to consider our options, so we set a date for the surgery so we’d have it if we wanted to move forward. It would mean a two-week recovery time for Spencer at home, with one to two days in the hospital right after the surgery was over. I’d have to prepare myself for him not being his perky self and trying to find faith that I could not only get him back to feeling good, but maybe even help him feel better than he’s felt for a long time. The devastating problem is, as much as I feel the surgery could give Spencer a very good year, or maybe more, there is no surgery if there is no way to pay for it. ©2017 Robin AF Olson. Even with all he faces, Spencer still gets playful and enjoys life. I’ve begged, borrowed, drained out my 401K. There’s nothing left. I have to depend on the kindness of all of you to consider helping Spencer have that blessed bonus year. There are no guarantees, but…Dr. W. said one thing that made my jaw drop. It might NOT be cancer. It could be a necrotic fat mass. Though the odds were about 25% that it was a benign mass, there’s still a tiny chance it’s not cancer at all. We will never know if it’s not cancer, or possibly give him chemo that he doesn’t need, if we don’t do the surgery and find out what that mass is. To possibly gain a year or more of GOOD quality of life, Spencer MUST HAVE SURGERY on TUESDAY, 12/5/17. I feel a lot of shame asking for help, but I need it badly for my boy. 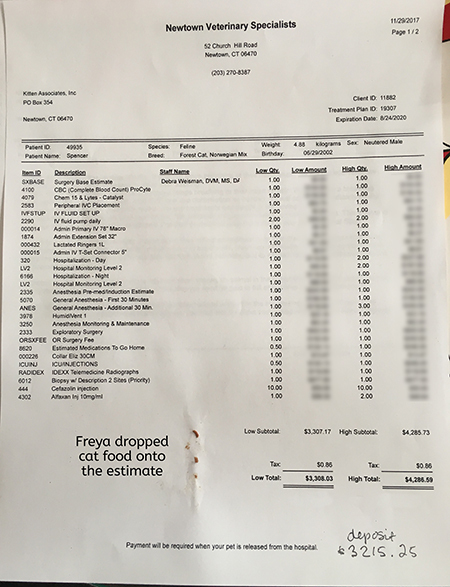 I’ve been asked to please not post a photo of the costs of each procedure or service, but I can post the total costs. I need to raise at least $4300.00 by MONDAY night (eastern time), December, 4 (a 75% deposit of the high amount is due when I drop him off before surgery). I realize it’s a breathtaking amount of money, but I have to try. Don’t donate if it’s a hardship. You don’t have to tell me you wish you could, but you can’t right now. That’s ok. I totally get it so don’t worry. If you feel like it, let your friends know our mascot needs their help and maybe some of them can provide a loving gift…tell them that a lady who has spent so many years helping others, needs it now, more than ever, for her cat, not for herself. Give a gift to Spencer HERE. Your gift is tax deductible and this is a great time to get a deduction before the end of the calendar year. If you need to write a check, those gifts will go to Spencer’s ongoing care since they won't arrive in time. Please make out your gift to: Kitten Associates and send it to: P.O. Box 354, Newtown, CT 06470-0354 and add a note that it’s for Spencer. ©2017 Robin AF Olson. Konked out. I can see your pink belly! My goal is to make the most appropriate decision for Spencer, not a rash, emotional wish. I know that only hindsight is 20/20 and the rest is well-meant, hopefully thoughtful and not selfish, good intentions based on advice from medical professionals. The rest is up to him, his body and the secrets that lie within. Please send Love & Light to my baby boy. Let’s crush f-ing cancer together! ©2013 Robin AF Olson. 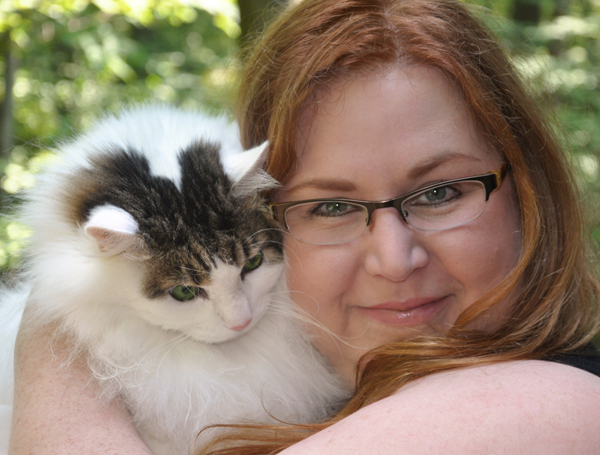 Me with our Covered in Cat Hair Mascot, Spencer. 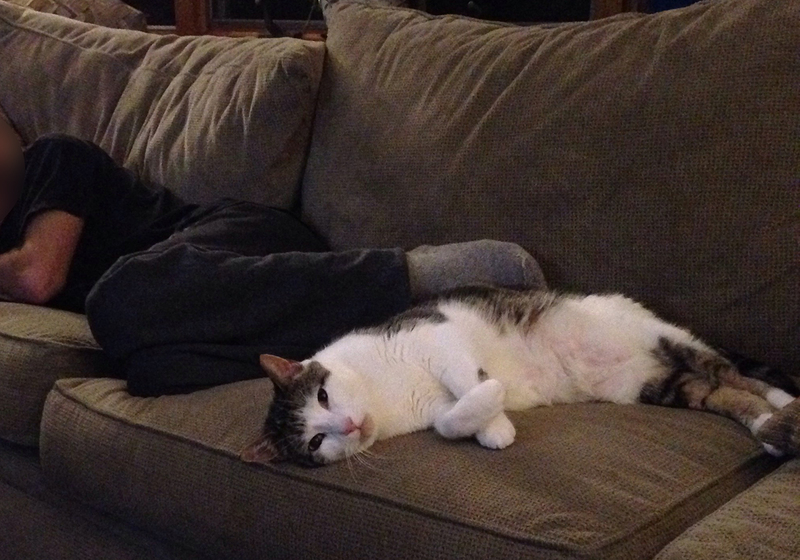 Saving Spencer: One Cat's Cancer Journey. Ch. 1. The semi-truck appeared over the crest of a hill on a curve in the road. For a moment our vehicles faced each other as I travelled in the opposite direction. All I had to do was stay on my side of the lane and all would be well, but I couldn’t help but feel the desire to turn the wheel hard left. It would take a flick of the wrist to put me into the truck’s path. The impact would certainly destroy my little car and end my life. 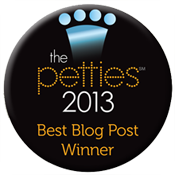 I was so distraught that the idea of ending it all gave me a momentary reprieve from overwhelming, gutting heartache. I was desperate to stop the pain. As that moment ticked on to the next and the next, I steadied my hands and stayed true, a thick slab of yellow dividing paint on the road the only thing keeping me from making a fatal choice. A few days later I sit here in my office and try to write. My words have failed to come for so long. I’ve thought over and over about what I would say, how I would let you all know that my love, my friend, my little shadow is going to leave me. I didn’t even want to think about it, I was so shocked at the news. The discovery was revealed so simply, really, but perhaps it was intuition that guided me to do something out of the norm, this one time. Or, maybe my guide was something more divine? Spencer, the 16-year old mascot of this 12-year old blog, my first “foster fail” 15 years ago, is terminally sick. There is no cure. There are treatments. There may be some things I can do to keep him comfortable for a time. How much time I may have with him has yet to be determined. A week before Thanksgiving, one of the cats threw up. Not usually a dire situation, but then Spencer vomited, so I worried there was a virus going around the cats. It was a great volume of food. Spencer has had life-long breathing problems, stemming from scar tissue in his right sinus after suffering from what must have been a terrible infection that occurred a long time before I ever fostered him. I spent two years doing different tests and treatments thinking he had asthma or allergies, only to find out the most simple answer was the right one. As a result of the scar tissue, Spencer wheezes. I’m always very careful about when he has to be sedated and sadly, because he also can get VERY stressed out in the car (he hyperventilates) and VERY stressed at the vet, I try to limit his trips. That’s why it was strange that when he vomited, my first reaction was to run him to the vet. He sounded quite bad. I worried he might have aspirated food into his lungs or sinus cavity. I could have opted to wait an hour or two, but my vet was going to close in less than an hour and if I rushed over they could check Spencer out. I was planning on bringing him in for his bi-annual exam in December because his kidneys have started to go downhill and we needed to update his blood work. Something in my gut to told me to go now and not wait. It’s not like I have funds to throw around, but I imagined they’d do an exam and we’d come home and all would be well. The fates must have aligned that night because Dr. Larry couldn’t see us. His partner, Dr. Mary was the one who examined Spencer not long after we arrived at the clinic. Dr. Mary doesn’t know that examining Spencer is a difficult task. Spencer “red lines” quickly, often hissing and snapping with Dr. Larry. He has to be quick about it or Spencer can require oxygen he gets so upset. But Dr. Mary is always upbeat and cheerful and speaks so sweetly to all of her patients. She’s very soothing for all of us to be around. She didn’t know about Spencer’s history. I even warned her not to do too much, but she cheerfully continued her exam, while Spencer’s pupils began to dilate with rage when she palpated his abdomen. “I feel a mass!” Dr. Mary exclaimed. Dr. Mary's cheerful veil fell for a moment. Sam and I both said that maybe it was stool she was feeling. We’d just brought our senior girl, Nora, in the week before for the same issue-raw fed cats often have very hard, crumbly stool. Dr. Mary shook her head no. She couldn’t break up the mass. Something was wrong. Very wrong. She asked if she could do blood work and an x-ray as my knees went weak with fear. I agreed we should do the tests if Spencer would allow it, while I tried not to cry. Maybe it was just constipation? Maybe he was just fine. Maybe she was wrong. 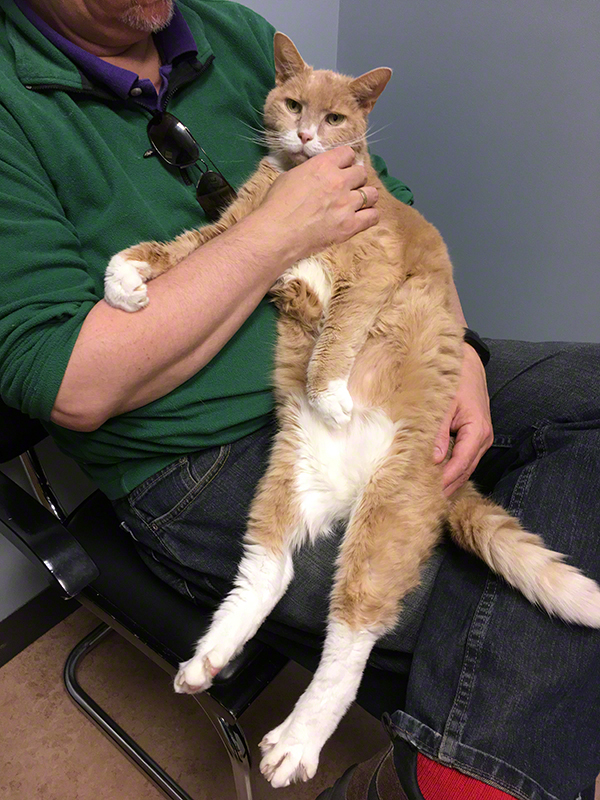 Spencer’s blood work looked ok. His kidney function was a bit better in one area and a bit worse in another. Mostly he was doing all right, which was great, but then she showed me Spencer’s x-ray. It was very clear there was a big mass in his abdomen. She explained that it looked like it was in Spencer’s omentum-it’s like a net that holds the intestines in place. 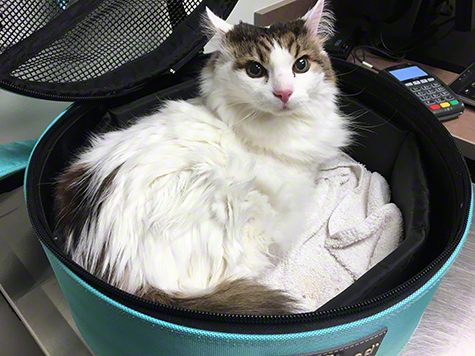 She felt it was likely some sort of cancer, but that we should get an ultrasound done right away to learn more. Dr. Mary was very kind and stayed late, even though the clinic had closed for the day. She got Dr. K on the phone to find out if she could come the next day to do the sonogram. Thankfully she could, but it would have to be first thing in the morning. I couldn’t be there. I’d injured my knee over a month ago and was starting physical therapy. Sam said he’d get Spencer to the appointment, but I wanted to skip my therapy and take him. It was a mess trying to juggle Sam’s busy schedule along with feeding all the other cats and foster kittens, while I tried to figure out how to maneuver rush-hour traffic to get to my appointment. Somehow I managed to keep it together, thanking Dr. Mary for staying late, being polite to everyone and thanking them for helping Spencer, but the second after we left the clinic and the door closed behind us, I burst into tears, nearly howling with anguish. The next morning, as I drove to physical therapy, I started adding up how I was going to pay for all of this, get Spencer what he needed, and hopefully find out this was all just a big scary monster and that everything was going to be okay. Except that it wasn’t okay. Dr. K had to sedate Spencer he was so upset. She found small lesions on his kidney and his liver. The mass in his abdomen might be connected to the “tail” on his pancreas or his bile duct. They called me during the test to ask if I wanted them to do needle biopsies of these organs and the mass and I answered yes right away. We couldn’t waste any time, even though I knew that needle aspirates don’t always provide a definitive diagnosis. We had to try. But the needle biopsies caused Spencer to have internal bleeding. He couldn’t come home for now. He’d have to stay for the day. They would do a PCV (packed cell volume) test on him every few hours to make sure the bleeding was stopping. I thought I was going to faint from stress. After the shock of the bad news, now I had to worry that the test was going to kill Spencer before I even knew what was going on. By closing time, Spencer was allowed to come home. The bleeding had slowed and it looked like he would be all right. We were to keep him comfortable and give him time to recover. The test results might take a day or two so there was nothing more to do for now. ©2017 Robin AF Olson. The setup in my office for Spencer. I have a huge dog bed in my office that has a pet safe heated pad on it. I set up a litter pan not far from the bed and a water dish nearby since Spencer drinks water due to his kidney problems (he gets sub q fluids too). I didn’t want him to have to go too far for anything. He needed to rest and get the sedation drugs out of his system. He walked around like a drunk, but thankfully was very hungry after his ordeal. He ate well, then retired to his bed. Spencer stopped coming upstairs to “tuck me in” as he has done so many nights over the years. Spencer barely left my office, though in all honesty I didn’t give him much reason to. Spencer would join us in the living room once a day for about an hour but then would wobble back to his heated bed. His appetite was okay, not great. He was still Spencer, but in those days it seemed like he aged a million years. During those next few days I had terrible anxiety wondering when the test results would come in. I started to pace around the house during the time when Dr. Mary might call-usually either when she first got in for the day or at the end of the day. Around those times I had my phone in my hand, a pad of paper and a pen nearby so I could take notes. I knew that whatever she told me, I’d probably blank out. Better to write some things down so I could look everything up later. But there was no call Thursday or Friday. I felt like a zombie. I couldn’t concentrate. I did some research and talked to a few friends. I played a guessing game with Sam about when and how and why I wasn’t hearing from Dr. Mary (an asteroid hit the lab and Spencer’s samples were destroyed…she had an emergency come in and would call me tomorrow…she’d call when I was going to the bathroom). 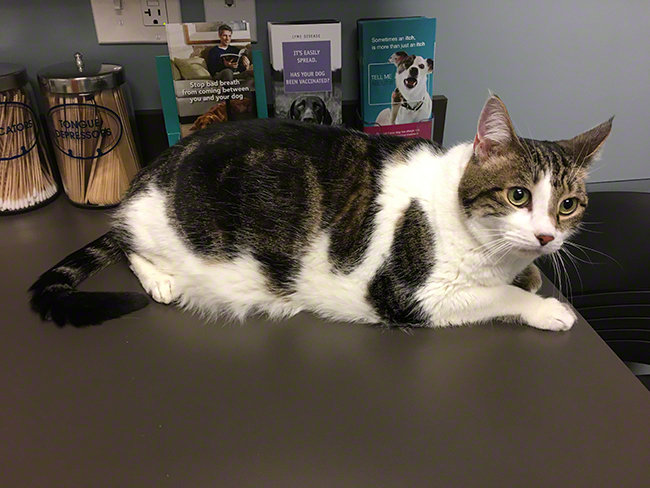 I imagined we were probably dealing with an aggressive cancer because Spencer had a mass, not thickening of the intestines or lymph nodes, which would suggest a more treatable lymphoma of some kind. I wanted to know how the Hell this could have happened. I prayed to God that it was just some weird benign thing, not something that was slowly killing my cat. Every time I checked on Spencer my gut hitched with fear. I didn’t know if he was slowly declining…did the needle hit something bad? Was he still bleeding internally? 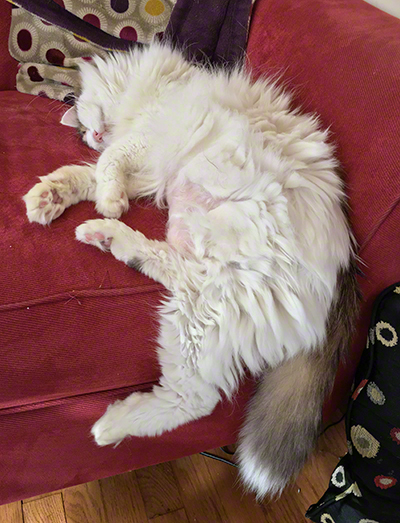 As Spencer slept, I could see his bubblegum pink belly where he’d been shaved. I saw the tiny round red scabs from where the needles entered his body. I wondered if the fur would grow back before Spencer died. I wished I didn’t think things like that. ©2017 Robin AF Olson. Spencer dreams while I have painful thoughts. Annie checked out all right. She’d had a cough for a few weeks and I wanted to make sure it was nothing serious. I couldn’t handle any more bad news. I spoke with Super-Deb, the vet tech and my friend. She talked to me about Spencer after I asked her to review his ultrasound report. She explained that because it was a mass it was probably an aggressive cancer. I was right in my thinking, but I wished I was wrong. She reminded me that what comes next will partly be due to how Spencer handles being at the vet. He won’t sit still for an IV full of chemo drugs. He might not be a good candidate for surgery, even. She surprised me by saying that Spencer was the top 5 angriest cats she’d ever dealt with—and she’s dealt with a lot of cats in her over 20 years as a tech. So I went home, heartbroken, wondering when I’d get the news. The weekend passed and so did Monday. I started to get angry, wondering what was taking so long. Of course the call came when I didn’t expect it-when I was just leaving my second physical therapy appointment. When I was alone in the car. It was Dr. Mary, sounding as cheerful as ever. Somehow the word CANCER didn’t sound so bad when she said it. Even when she said she was sorry, her voice softening ever so slightly, as she suggested I take Spencer to an oncologist I didn’t get upset. I’d already made an appointment for him with Dr. McDaniel since it was Thanksgiving week and I worried that if I didn’t move fast we’d lose another week. I didn’t cry. I already knew it was carcinoma and I was resigned to this truth. This news was just sealing Spencer’s fate. 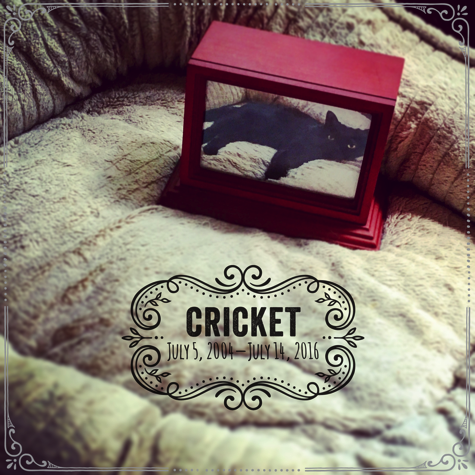 The day before Thanksgiving, when so many other people were racing around, doing their final errands before celebrating with their family the next day, I was sitting in a waiting room with my beloved cat waiting to talk to an oncologist. I never want to be an ungrateful person, but I honestly did not feel thankful for anything this year. It’s been financially the worst year ever-with my poor fatally sick foster kittens nearly bankrupting Kitten Associates, too. I wrote a very very long blog post that I’m not sure you’ll ever read, but it talks in great detail about how very broken I am and what this year took out of me. I’ve sacrificed the past 7 years of my life to saving lives and I’m exhausted. My family, for the most part, is gone. I’m very lonely. Holidays have lost their joy. They too often feel like just another day. It shouldn’t be like that for anyone. And now, after all that, I discover my dear boy Spencer has a heartbreaking secret. I don’t know how I missed it because I watch my cats like a hawk. I try to keep thinking things will get better, but they don’t. I’m a rat in a maze with no way out. It’s hard not to turn the wheel and make it all stop, but I have to find a way. Spencer needs me. I can’t let him down. ©2017 Robin AF Olson. A bit worse for wear, my precious boy. 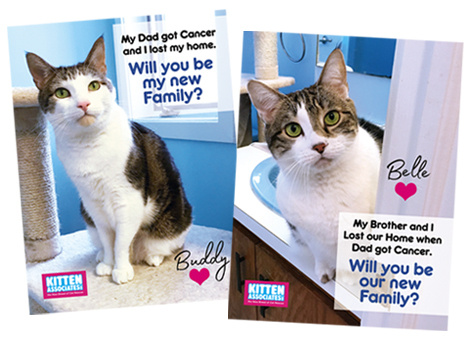 Read more about Saving Spencer: One Cat's Cancer Journey. Ch. 1. Cats are evolving as they navigate from living in the wild, to a life spent indoors with humans. 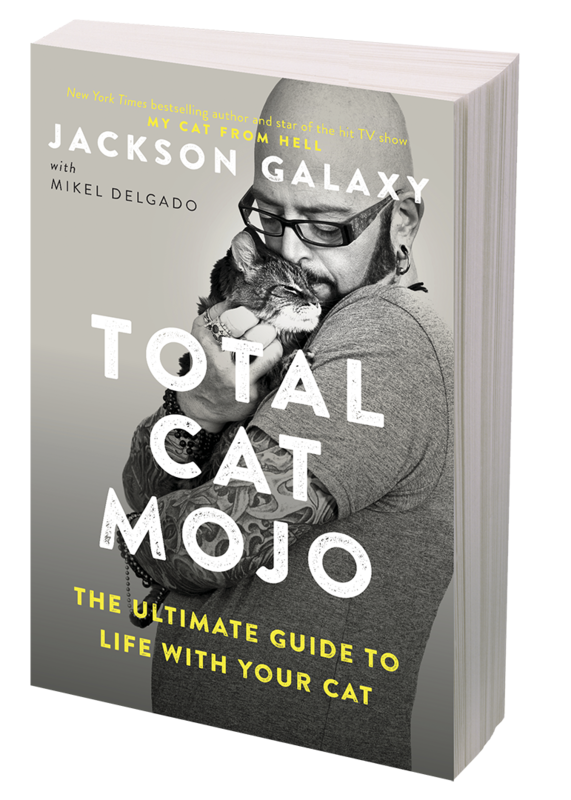 The resulting problems that inevitably follow when two species try to get along in a shared space, but don’t speak the other’s language is the core of Jackson Galaxy, the New York Times bestselling author of Catification, and host of Animal Planet’s My Cat From Hell’s, latest book, TOTAL CAT MOJO: The Ultimate Guide to Life with Your Cat. Galaxy kicks off this charmingly illustrated guide with a story surrounding a phrase he coined: Cat Mojo. What is it? Why is it important that our companion cats have mojo in the first place? It’s something we all notice, but may not have a word to describe it. Each of our cats have it to varying degrees, but each cat is different. At their core is a confident creature either yearning to blossom (and who needs our compassion and support to get there) or one who is already strutting his or her stuff, but may be causing other strife in the human home. As others have written before him, Galaxy dives deeper, underscoring that we can never truly understand our cats until we look at the world through their eyes, not our own. We cannot have a relationship, yes, relationship with our beloved cats without getting to know what makes them tick. Galaxy hits this point home in a heartfelt, passionate way, nearly imploring all of us to get down on all fours and look around. It’s a different view of the world from under the sofa or on top of the ‘fridge, when we’re terrified of the dog, the kids, or simply being a stranger in a strange land—as cats often feel entering their “forever home” for the first time. To get to know our cats, Galaxy starts at the very beginning. It’s like we’re on a date with our cat and the first question we ask is “Where are you from?” He and co-author, Mikel Delgado, Phd, go into great detail about where cats were first known to exist millions of years ago, along with a timeline of how they slowly, but surely began a journey, living closer and closer to humans until only recently (less than 100 years), they began to live indoors with us full-time. This part of the book effected me deeply. It was a reminder in ways I hadn’t considered that my fluffy, purring, sleeping-on-my-lap-cat, is still a hunter, not far removed from his wild-child ancestor. Being out of touch with our cat can result in all sorts of behaviors that we humans consider unacceptable. Those “bad” behaviors can lead to a terrible ending, literally, for the cat, when they get surrendered to a shelter, kicked out on the street, or worse, and Galaxy lays down the challenge line asking us to reconsider this label. Once you understand your “Raw Cat,” Galaxy provides a section he refers to as his toolkit, a little like his guitar case, filled with in-depth information about the particulars of how cats spend their day, their natural rhythms, their need for predictability in their environment and what happens when that gets disrupted. TOTAL CAT MOJO: The Ultimate Guide to Life with Your Cat, at 345 pages, is a must-read for anyone who just got their first cat or who has a cat or two (or eight), but who finds themselves completely frustrated by their antics. This book is filled with “ah-ha” moments, clearly written as if you’re in the room with Jackson himself and he’s your private tutor. Galaxy includes occasional asides that remind us he’s been there, too. This is no preachy tome. 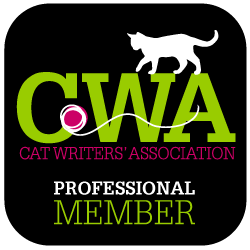 It’s very accessible to any cat lover and I highly recommend it. Where I feel this book hits a bump in the road is with the amount of catch-phrases or special lingo. That said, if we are to truly understand our cats, perhaps we need a new lexicon and if so, this is it. ©2017 Robin AF Olson. Kitten Associates foster kitty, Annie Jones, showing off her #TotalCatMojo. What I loved about TOTAL CAT MOJO: The Ultimate Guide to Life with Your Cat was that Galaxy gave reason after reason why free-feeding kibble is bad for your cat and for a cat to be truly Raw (and therefore closer to his ancestral self) he has to be fed a raw meat diet. He also goes into depth about the often dreaded litterbox issues many people face (Galaxy refers to it as “Raising the Yellow Flag”). 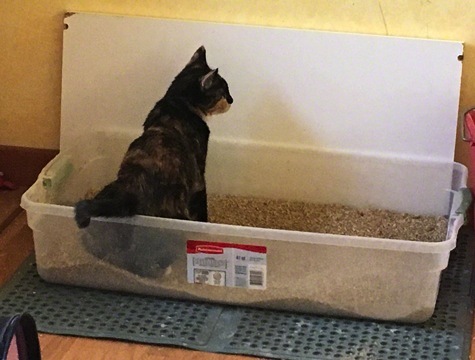 I have a feeling many who read “Cat Daddy’s 10 Litter Box Commandments—Quick View,” will cheer, knowing that at last they have hope of a remedy that will work for everyone, humans and cats alike. TOTAL CAT MOJO: The Ultimate Guide to Life with Your Cat is the universal translator to understanding your cat’s language and why it’s vital we be willing to invest in a deeper, more compassionate relationship with our cat. Cats have been misunderstood for decades, with deadly consequences, but with Jackson Galaxy at the helm, those notions are changing, and for that I applaud his efforts. 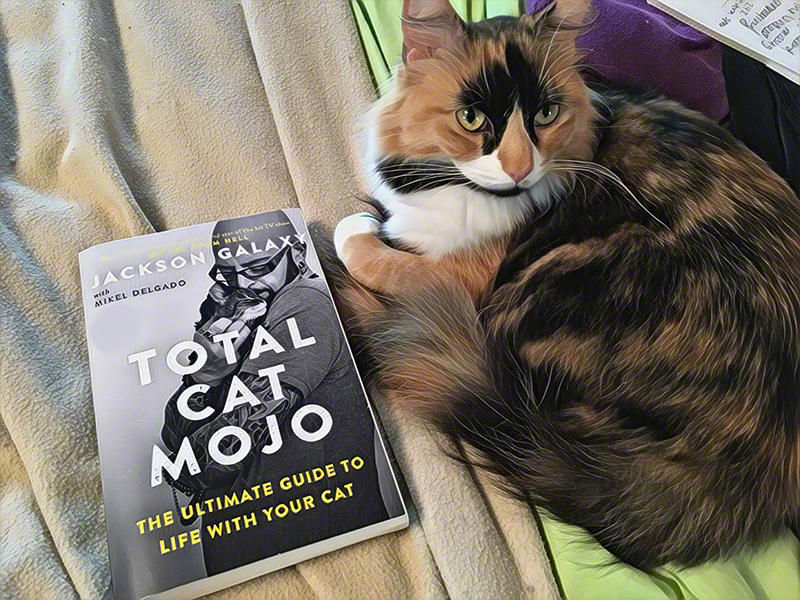 TOTAL CAT MOJO: The Ultimate Guide to Life with Your Cat is available NOW! 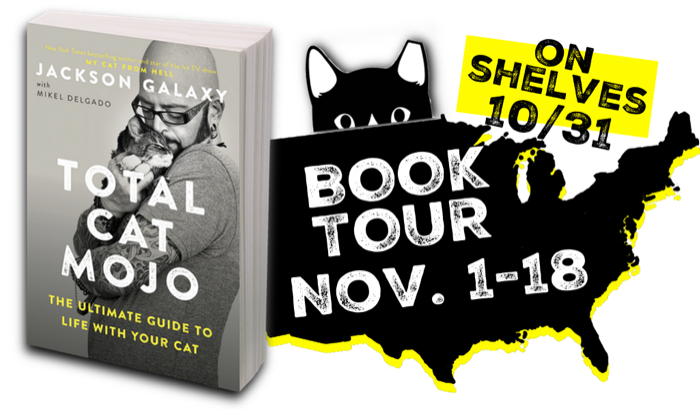 If you want to SEE Jackson Galaxy LIVE and in person, he’s starting a book tour starting November 1, 2017. Pop over HERE to get details of when he’ll be in a city near you! Like what we're up to? Follow us on Facebook, Twitter and Instagram! 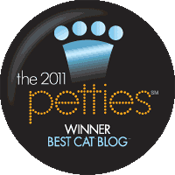 Learn more about our rescue, Kitten Associates! On a crystal clear afternoon last November, Buddy and Belle lost their home. They didn’t lose it due to a natural disaster like Hurricane Irma, but instead to a human crisis. Their dad, my former flame of decades ago, called me, begging to please take his cats. I have cancer he said. It was advanced liver cancer. He was probably not going to live much longer and would I take his cats? I’ve been contacted many times by families who have lost a loved one, who don’t know what to do when a pet is left behind. Was this going to happen to my ex? How could I say no, but how could I say yes? 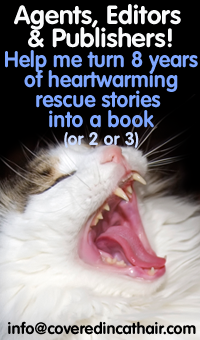 It would be a terrible burden on my rescue. His cats were 6 years old. It wouldn’t be a quick placement. I don’t have a shelter, so it’s not easy for people to just come and see them. 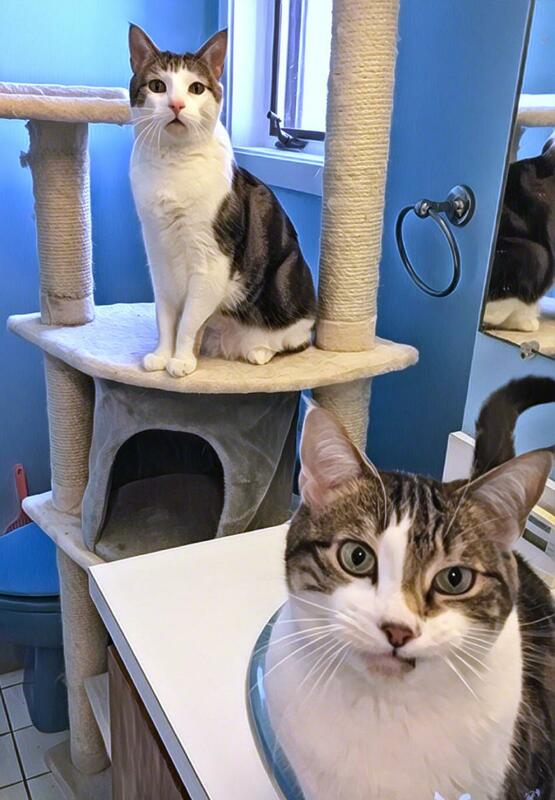 They’d have to go through the adoption process just to meet the cats and with the competition of kittens available for adoption, the odds were slim Buddy and Belle would be adopted any time soon. ©2016 Robin AF Olson. My first moments with Belle where I promised her it would be okay one day. She just had to trust me (and I had to hope I could really pull this off). What was worse was their being in our foster network meant I’d have to say No to a lot of kittens who needed our help, because I’d lose that foster space to adult cats. I wrote about my struggles and my anger about the situation in a 3-part post (links for them are at the end). I knew my ex was going to screw me one last time by dumping his cats on me, but I also knew that I’d say yes and take the cats for their sakes, not for his. He was prone to being a drama-queen back then and was still now. That sounds cruel, but it’s not, especially when you get the part of this story about what happened recently. Bear with me. Poor Buddy. Poor Belle. It was clear they were in shock and stressed out when they arrived. They were in terrible condition, too. They were both overweight, had never had decent food, not even one bite of the worst canned food, ever. They ate the cheapest kibble, stored in a plastic jug that sat on the floor. It cost my rescue $5000.00 in surgeries, medications and vet care to get them back on their feet. 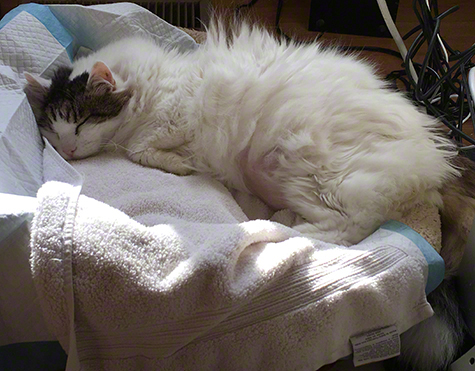 Meanwhile, our 16-yr old cat, Nicky was on his last legs. We couldn’t spend much time with him the week Buddy and Belle arrived. They had to be in surgery as soon as possible. There was too much going on, but but I put my head down and plowed ahead. We quickly realized Nicky needed vet care, too. In fact, Nicky, Buddy and Belle were all at the vet on the same day. It was a nightmare to try to stay on top of which cat needed what treatment or procedure next. ©2016 Robin AF Olson. Belle's first vet visit in her LIFE. Sadly, Nicky never came home. We had to put him down that night after he’d had a grand mal seizure while on an IV at Dr. Larry’s. I felt like we had to sacrifice our last days with our precious boy to care for someone else’s cats. I was furious. This was not right. I sacrifice SO MUCH to do rescue yet it wasn't enough. ©2016 Robin AF Olson. Ten months after this photo was taken, Sam and I still cannot talk about Nicky. The pain is too much. Belle lost half of her teeth. 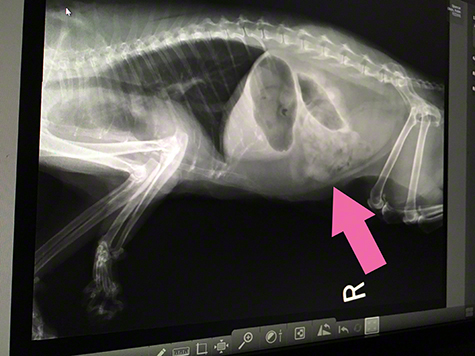 Buddy had a bladder full of painful crystals and a suspicious cyst (Dr Larry biopsied it and it came back benign). Buddy was withdrawn for months. Belle, began to slowly flower, but I could tell she was depressed living in my blue bathroom. ©2016 Robin AF Olson. What cheap kibble does to the inside of a cat's bladder. 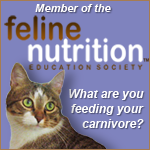 It took three MONTHS for me to get Belle to eat canned food and get her off kibble. Thankfully Buddy had a better appetite. Belle slimmed down and began to eat better for me. I realized I had a brand of canned cat food that was made up of small, round shapes, similar to her kibble. I offered her one tiny piece of canned food and she ate it. She recognized the shape and would eat the food if it was broken up into tiny bits. It took a long time, but eventually she began to eat more and more brands of canned food. I could stop worrying about her losing weight too quickly, but it wasn’t good enough. They were lonely. Pitifully lonely. I couldn’t spend enough time with them and it wasn’t fair. Now that I had them eating consistently, I could move them into a better foster space. 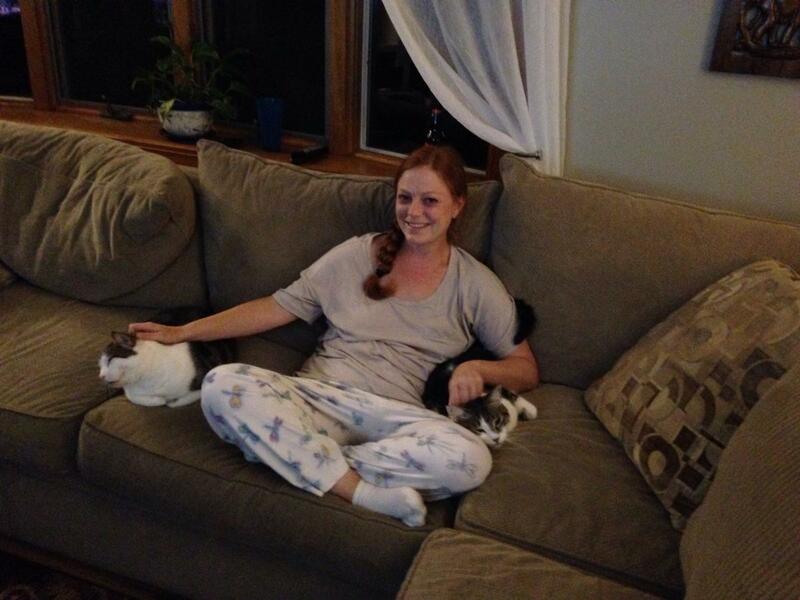 Jame (pronounced: Jamie) and her daughters, Grace and Frances, are my go-to foster home for kittens and friendly cats. I love this family like my own. They’re so smart and capable and eager to learn about cats. They graciously agreed to take Buddy and Belle knowing they might be in their home for months. They gave up fostering kittens for the spring and summer. I was so very grateful that Buddy and Belle would have full run of a finished basement lined with a row of big, sunny windows. They could enjoy a lot more attention than I could provide. I hoped they’d be happy. ©2017 Robin AF Olson. . I worried about Buddy and Belle feeling like they lost their home with me, but it wasn’t the right place for them. I worried they would stop eating (again) or just hide for weeks on end. It was a rough go for a time, but eventually they adjusted. Having the attention of this loving family made a big difference. Meanwhile, I kept trying to find them a forever home to no avail. No one wanted adult cats, even though I lightheartedly described them as 72-month old kittens on their adoption listings. Ten months later, my rescue, Kitten Associates, took part in the national event called Clear the Shelters (more on that another time). Part of the festivities included an adoption event at BMW of Watertown (thank you guys!). I was to bring all of our 14 foster kittens for the general public to meet and hopefully adopt, but I knew Buddy and Belle couldn’t take the stress so they remained at Jame’s house. ©2017 Robin AF Olson. Belle making sure Buddy is still Buddy. At the last minute I decided to design and have printed two huge posters, one for each cat. There wasn’t much text on the banners, just portraits of the cats. I hoped I’d captured their essence in my images. They were goofy, loving, playful and so filled with love. They were gentle cats and had been with kids thanks to Jame. I just needed someone to believe in them and realize that kittens aren’t always the best option to adopt. While we were setting up the showroom for the event, Kathleen and her son, Jace came over to me. She told me about their cat Morgan and how he’d recently died. How Jace, at only 3 ½ years old, could not truly process death. His understanding was to relate it to cars. When the car got old it went to be recycled and would come back as a new car. I asked him what he would call his new cat and he answered quickly, “Morgan, of course.” ...once it was done being recycled. Normally I don’t consider it safe to adopt kittens into a home with such a young child, but Jace had already grown up with Morgan. He told me he missed his cat and was so sad. I also knew that Buddy and Belle had once lived with a little girl. Since they’re adults it was worth a try to place Buddy and Belle if Kathleen would consider adopting two slightly used cats. I told Kathleen Buddy and Belle’s story. She teared up. She didn’t want kittens, especially after she heard their story. This woman is so sweet and compassionate, she completely understood their plight. Buddy and Belle’s home was long gone. They needed the love and support of a new family-one that would stick with them no matter what. Kathleen wanted to be that family if it was a good fit. I was hopeful, but not sure if it would be a match. I moved forward with the adoption process and they passed with flying colors. Over a week ago Kathleen, her husband Jay and son, Jace met Buddy and Belle. 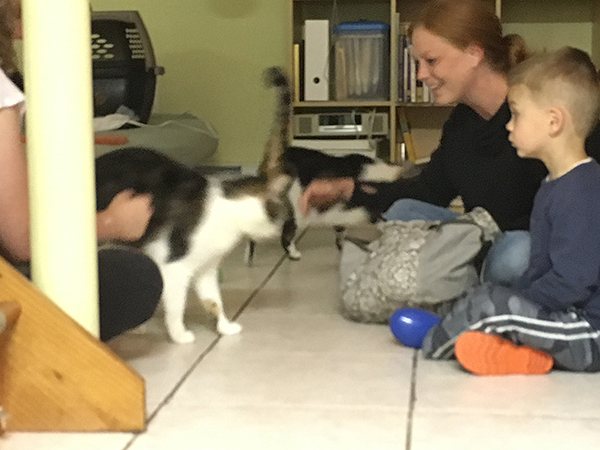 I was worried the cats would run and hide with so many people wanting to interact with them. As Jame, her daughters, and I looked on, Kathleen cautiously held her hand out towards Belle, who took a careful sniff, then leaned in to be petted. At that moment, I saw the look on Kathleen’s face. She lit up with pure joy. It made my gut hitch. She loved this cat. I could tell in that first moment, but I said nothing, afraid I might push too soon. ©2017 Robin AF Olson. The first moment Kathleen met Belle was magic. Buddy and Belle took turns being a bit shy, then playing with Jace (which made him giggle with glee) or sitting to be petted by the family. Jame’s daughter Frances and I kept exchanging glances, our eyes wide. Without a word I knew what she was thinking. This is it. This is the family, isn’t it? Was it too much to wish for? We had our answer barely an hour later. Kathleen shocked me by asking me if I thought it would be ok for them to make Buddy and Belle part of their family. They asked ME for my blessing? ME? Are you kidding? This was a love match if I ever saw one, so of course I said YES! ©2017 Robin AF Olson. Buddy and Belle with their new family. Then Frances turned to me, stunned; “You mean they’re getting adopted now? As in RIGHT NOW?” I nodded somberly, yes, suddenly realizing the girls hadn’t had a chance to say goodbye to their foster friends. I invited the family upstairs to the kitchen to do the adoption paperwork while Jame and family had time to say their goodbyes. I didn’t want to get excited. I was scared the cats would be returned right away. I warned the family that Buddy might shut down and to give him a lot of time to adjust. He might hide a lot and to leave his cat carrier out because he liked to de-stress inside it. They promised they would go slow and were so gracious and thankful to both Jame and her family and to me for taking them on. I asked her to update me if she would be so kind. We gave them Belle’s bed, Buddy’s hidey-cat-carrier, toys, food and even their old litter pan so they’d have familiar scents in their new home. 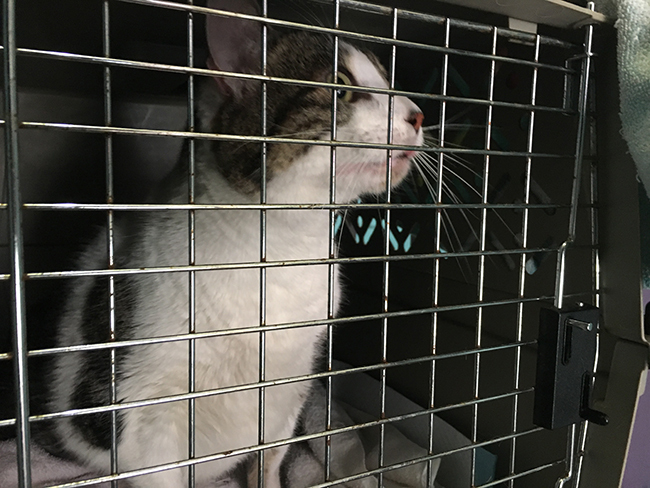 With the cats safely in a big carrier, we brought them outside, as a gentle rain fell from gray skies. A wave of sadness hit me. After the resentment and anger from all those months ago faded away, I realized I loved these cats as my own. They completely charmed me, but I would probably never see them again. I could only hope that I’d get updates from time to time. It was tough not to cry. They’d had a rough journey, but now they could finally relax for the first time in nearly a year. The next day I got a promising update. Buddy and Belle were home. Really home. They didn’t have to adjust to living with Kathleen at all. They took a nap on the sofa, Buddy choosing to snuggle next to his new dad. He didn’t hide at all. Belle climbed up on the cat tree and looked out the window. They were already eating and using their litter pan. ©2017 Robin AF Olson. 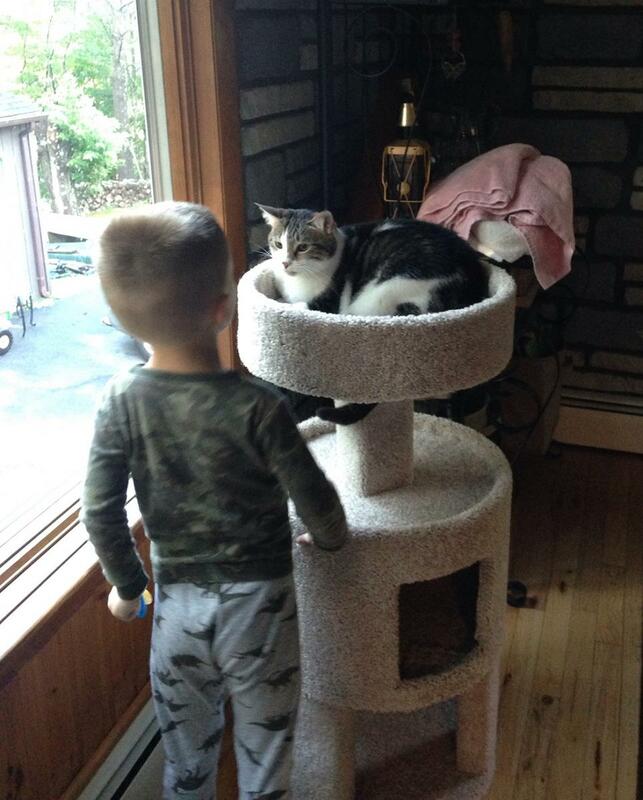 Belle on her new cat tree with her new friend, Jace. I was stunned. These cats had always been fearful, but clearly they were in the wrong homes. They were good homes, but not the right home. This was right. This was it. They finally had what we all yearn for-a safe place to sleep, shelter from the storm of every day life and love. In just over a week since the cats have been adopted, I’ve gotten a few updates. Each one is accompanied by photos of the cats looking completely relaxed and happy. 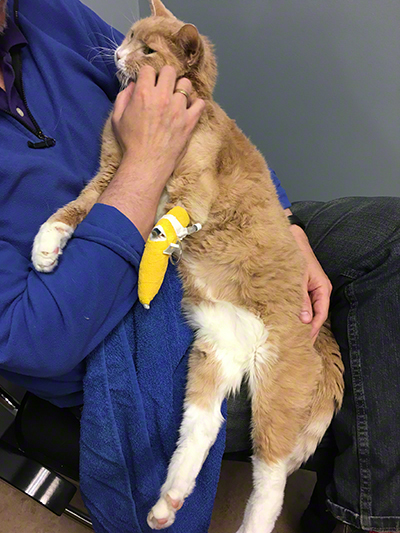 “Nearly first full week and we have learned that Buddy enjoys his nose being gently massaged. He also fetches and retrieves the krinkle balls. ©2017 Robin AF Olson. Buddy fell asleep next to dad, Jay, within a few hours of arriving in his new home. I guess he knew he was finally home. And as for my ex, well his latest Facebook post declares he’s cancer-free and already fishing again in Sheepshead Bay. In the nearly year since we’ve had his cats he never once asked me how they were doing. He never answered my emails telling him we could not afford the burden of the costs of his cat’s vet care. That was on me to solve by begging for donations. What a creep. He just wanted someone to dump his problems on and he knew I’d be a sucker. I wonder if he’s going to adopt cats again? I sure hope not. I feel bitter and want to hold onto my anger, but in truth, I’m ready to wash my hands of having anything to do with him ever again. He doesn’t deserve such amazing cats, or my complete dedication to providing for them. I’m damn glad I got them away from him. ©2017 Kitten Associates. B&B with mama. I'm betting they'll be good lap-warmers as the days grow colder. Buddy would be dead by now without me stepping in, no joke. Belle’s mouth was so painful with broken teeth and teeth falling out of her mouth that it would have been horrific torture to stay with him. He cheated on me and was completely unrepentant all those years ago, yet as I write this I realize here’s more proof that I will do anything to help cats, even if it means dealing with someone who hurt me so badly. But then I look at the photos of Buddy and Belle with Kathleen and her family and my anger turns into joy. Their life begins anew, filled with the promise and hope that this time, this family, is theirs forever. ©2016 Robin AF Olson. I will really miss these guys. Good luck and happy life! 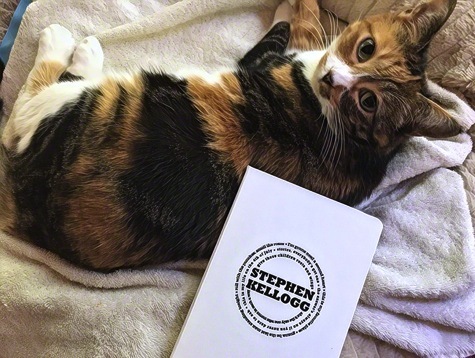 I’ve been writing in my Stephen Kellogg embossed journal every day since Holly arrived five weeks ago. Today I made the final entry. ©2017 Robin AF Olson. My cat Mabel with my journal. Keeping a diary REALLY helped a lot. I was able to track how many times Holly peed, but more importantly what I was doing to change her behavior. I tried feeding her on the spot where she'd peed before. It worked for a few days, but then she still peed on the bed. That was a good data point to help me decide what to do next. It was time for Holly to be reunited with her family. There weren’t any more tests I could put her through. The next one would be to see how she does once she’s home with her family and without the companionship of other cats. I warned the Kellogg’s that Holly might need more time before she completely stopped peeing. We couldn't know how much stress she’d experience making such a big change. I felt she should not start off in a small space, but just come home with access to her usual places so things didn't seem different to her (all of which had been steam cleaned while she was gone). They'd have to monitor her carefully and remember that it takes at LEAST 4 weeks for the Prozac to take full effect-more like 6 weeks. ©2017 Robin AF Olson. Stephen did come to visit Holly after he returned from his Tour and she was very happy to see him again. My name is Holly Ivy. I may look familiar to you on the outside, but inside I’m a different kitty. While I’ve been away, I’ve been on an adventure. I met some terrible beasts, but they became my friends because of my inherent good looks and charm. I also met some people, who, at first I wasn’t so sure about, but guess what? They became my friends, too. One of them, I call her Aunt Robin, was super nice to me and because she is so squooshy, she made a nice bed for me to sleep on. Another new friend is Dr. Larry. He has a pretty loud voice and where is his fur? It certainly is not on his head. That is weird. Anyway, Aunt Robin and Dr. Larry said that I was a wonderful kitty, but to unlock my magical powers I needed a little bit of help so I could become the best kitty ever, a Kellogg-kitty. I told them that sounded good to me, but how would these powers be unleashed? Honestly, I still don’t know, but whatever they did must be working because I don’t get scolded any more and no one is tense around me any more. In fact, everyone can finally see me for who I really am…the super-prettiest, the pom-pom-fetcher, the smile-maker, the love-bug, and fifth Kellogg daughter. I missed you all so very much and I am so glad to be home. I hope I never have to leave you again, because even though everyone was really nice to me, there’s no place better than with my family. I hope we can forget the past and move forward with joy because that’s what life is all about. I wanted the Kelloggs to have a clean slate and start fresh with Holly. I knew it was a lot to ask, but I’d also shown them that Holly could go a few weeks without resorting to her old habits. I’d come to understand that cats can learn to outgrow their inappropriate behaviors while on Prozac. It could take six months to a year. She might always need to be medicated, but at least we have something that worked for two weeks. Now comes the true test. Stephen met me at the door in his loungewear (PJs?). I guess he felt comfortable enough around me to be himself. I wasn’t trying to be cool any more, no longer worried about what I was wearing, either. We were at ease as he bent down and nonchalantly opened Holly’s cat carrier. She walked into the kitchen, tail up, excited. Within seconds we could tell she knew she was home. 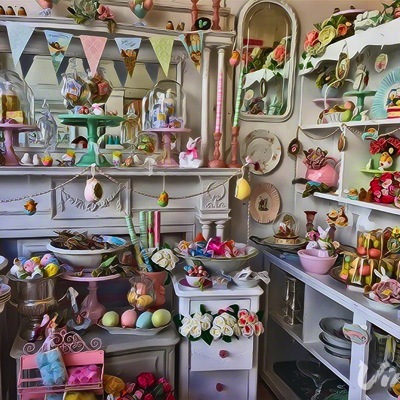 She gently rubbed her cheeks against a toy filled basket on the floor and again on the corner of the kitchen island. She was a busy bee, refreshing her scent around the main rooms of the first floor. Stephen was busy filling up the litter pans and sweeping up some loose grains from the floor. I kept an eye on Holly, tossing her a pom pom, which she ran after, or following her into the room where she’d often peed on the sofa. This time she was exploring and though her pupils were rather large, she still had a confident, happy air to her. ©2017 Robin AF Olson. Holly-girl with her daddy. Kirsten returned home from dropping the children off at school. She was clearly happy to see Holly again. I’d suggested they didn’t tell their daughters that Holly was going to come home today so they kept it a secret. Their second oldest daughter, Adeline, had asked before leaving for school if they could visit Holly this week, anxious to see her again. I was grateful there was still a connection even after all this time and wished I could see her face once she realized Holly was home. I was grateful, too, that although Stephen has been clear he does not have the bandwidth to go a crazy distance with Holly (again), he is willing to give it another try. I’m guessing because of how hard I worked to solve this problem he's willing to continue…and I think, too, because he trusts me (and that is a great gift). ©2017 Robin AF Olson. Two normal and cool people with Holly and...yikes. I showed Kirsten and Stephen how to hide Holly’s magic pill into her food. It’s a bit of a fussy thing to have to do, but it’s only once a day. We gave Holly a snack and she ate it right up. It was a good sign that she was adjusting to being home after only a few minutes. It gave me hope. Holly returned to her favorite spot next to the vent under the refrigerator. The warm air was soothing and the Kellogg’s often found her there. We gathered around her in a semi-circle, all sitting on the floor. 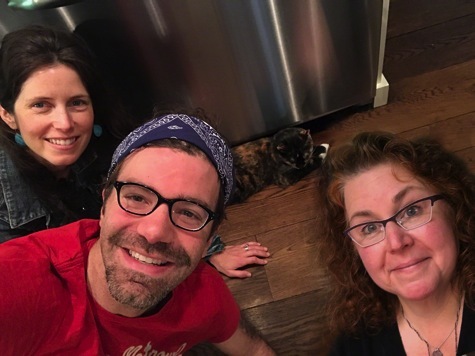 Stephen took a selfie of all of us together, but I didn’t realize I should sit up so I looked like an idiot laying on the floor while they sat up, smiling for the camera (so I sort of fixed it in photoshop!). I really wanted this last image of us together to be the one that would bring this story to a close, perfectly, but as so many things go, events unfolded in ways I never expected. ©2017 Robin AF Olson. Ha ha ha...photoshop! Three months ago, a guy sent me an email asking for help with his cat, Holly and I never could have imagined where our paths would take us. Today my heart is full. I’m fighting back tears, but it’s a losing battle. I worked so hard to save Holly from having a terrible future. I gave up a lot of my time and resources. I asked so many of my peers for help. I pushed and begged and cajoled, and in the end, at least, so far, knock wood, it was completely worth it. Holly peed on the eldest daughter’s bed. 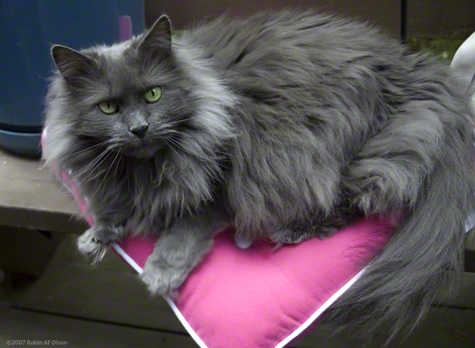 Holly began peeing on the bed, on her own cat bed that was on the mattress, on Mia’s cat bed that was on the mattress. I did load after load after load of laundry. All the pillows (all six of them) had a little bit or more of urine and had to be washed, too. Clearly Holly was adjusted to being in my home and was back to her old behavior issues. Even though I’d been through things like this in the past, this was really bad. I was constantly on edge and it was a vivid reminder of what the Kelloggs had being going through. ©2017 Robin AF Olson. Screen shot from my web cam footage showing Holly peeing in her own cat bed. Andy is peeing in "her" litter pan (they were all using either pan by then) but he got in there AFTER she started peeing in the cat bed. Kirsten and the girls came to visit Holly. Less than 10 minutes before they arrived, she peed on the bed for the second time that day. About an hour after they left she peed yet again. I felt that Holly was spinning out of control, fast. Also, the amount of urine was alarming. It wasn’t a small puddle. It was a great volume of urine. ©2017 Robin AF Olson. Good thing she's cute. I spoke with Dr. Larry again and we were both torn about next steps. Did Holly need an ultrasound now? Another urinalysis? Or did she need Prozac? 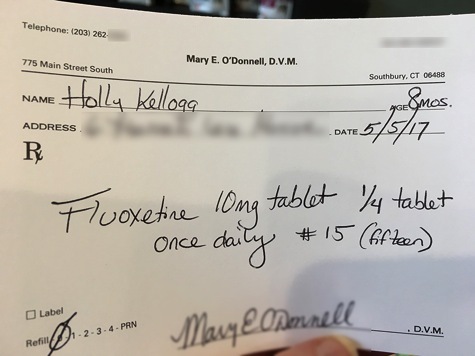 I did NOT want to put her on medication at such a young age, but I did find out that unlike other anti-depressants, with Prozac Holly would feel more relaxed, stopping inappropriately eliminating and learn that she does not need to continue this behavior. There was a chance that in 6 months to a year she could be weaned off the meds and in essence grow out of this behavior problem. I had to do something so I started Holly on Canna-Pet. From the company: "...Canna-Pet is NOT simply a “CBD product.” In fact, Canna-Pet is something totally and truly unique. All Canna-Pet products are formulated with an awareness of the benefits of whole plant extracts, to provide an “entourage effect” from the inclusion of eight additional cannabinoids and more than 20 terpenes beyond “just CBD” – along with higher bioavailability. This proprietary production and formulation makes Canna-Pet® unique." ©2017 Robin AF Olson. Everyone on my lap. 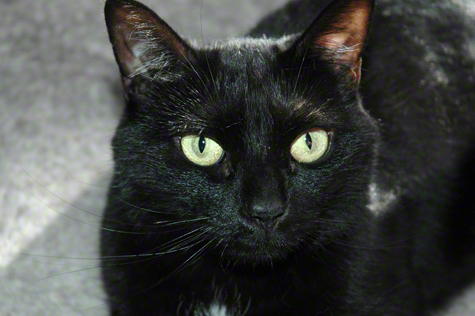 I’d been using Canna-Pet on my cat, Spencer, to soothe his arthritic bones and saw it helped him a lot. It can also help with stress, and I didn’t have to ramp up the dose or worry about weaning her off it if it didn’t work. Dr. Larry agreed to give it a week and see how it went. If it didn’t work we could go on from there. A day or two passed without incident, but Holly began peeing on the bed again every so often. It was very difficult not to strangle her I was so tired of doing laundry and cleaning up the room. The room was becoming empty of any furnishings. There were no pillows on the bed and barely any cat beds left. If Holly began to pee on the cat trees that would be a deal-breaker. I wouldn’t be able to launder them and it could ignite a fire under the other cats and they might pee on everything, too. ©2017 Robin AF Olson. Funny-Face. Kirsten and the girls came to visit again and again I had to have a sit-down with Kirsten about what was going on. I knew it was shocking to her that I felt we needed to go to Prozac, but I got her blessing to start that day. I felt so badly. I really didn't want to have to do this, but my hand was forced. I showed Kirsten how I’d be sneaking the pill into a treat. It’s only ¼ of a small pill so it was easy enough to hide. I gave Holly her first dose, realizing it was her last chance to stop her inappropriate behavior. ©2017 Robin AF Olson. Fits in like one of the Kitten Associates family now. The girls were great with Holly and so happy to see her. It made me feel doubly worried that maybe this was the last visit they'd ever have with her. I tried to shift gears emotionally, so I changed the subject and asked the girls about Irish Folk dancing and why they keep their arms down straight. Sophia, Stephen's eldest daughter, said it would look funny if they moved their arms around and proceeded to do an amazing Irish Stepdance in my living room both with her arms straight and then waving her arms around. It was hilarious and just what I needed. Day 3 of Prozac. Nightmare. 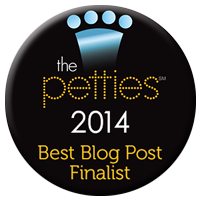 From my journal: "Holly has pretty much become unglued. She just peed on a cat bed, right in front of me. A bed that was not on the mattress, but off on another side of the room. She peed a lot of volume. I lifted her during her peeing to put her in the litter pan and she peed ON me." It was 1 o’clock in the morning. I was so mad I wanted to throw her into the wall, but I just cleaned up with tears of rage rolling down my cheeks. I was so fed up and tired. Three days on Prozac turned her into a nutcase worse than before. It was the third time she’d peed on something that DAY. But I couldn’t give up. I knew if I did I would hate myself later. Under the veil of my frustration was care and concern for this creature. She was a total love-muffin and happily fell asleep with her head against my cheek. I loved her! I knew if I could get some rest I could re-set my emotions and try yet again. The next day I gave Holly her pill. Somehow a tiny bit of it wasn’t covered and the terrible taste freaked Holly out. It took 8 more tries over the course of the day to get her to take the pill. I hid it every way I could think of, even in a frozen ball of butter, but every time she outsmarted me. I finally was so fed up I had to get Sam to hold her so I could shove the pill into her mouth-she spit it out-but I finally got the job done. I knew it upset Holly forcing the pill into her, so I expected her to begin peeing. I wondered how I was going to get a pill into her ever again. I wondered if she would ever trust me again. I knew if I gave her some time and was careful that maybe she would recover from the pill being forced on her. I didn’t put Holly back into the crate. I let her be. I let myself be and took some time off to be alone. If she peed, she peed. I couldn't do any more for anyone. Guess what? She didn’t pee on anything over night. It was a new day. Fresh start. I was able to figure out a new way to hide her pill and it worked-easily! Holly was playful, continued to eat well and even sat on me, purring loudly. Who was this cat? The next day, same thing. No peeing on anything. Got her pill into her easily. There was something different about Holly. It was as if her edges were ever so slightly softened. I left 2 pillows on the bed over night. She didn’t pee on the bed or the pillows. I left the pillows on the bed a second night. They were fine the next morning. This morning I returned Holly’s cat bed to the bed. If something was going to set her off, this was going to be it. Annie and Andy ran over to it, sniffing at it. They began to “make muffins” on it as Holly walked over. I tensed, ready to see Holly furiously scratch at the bed, then pee in it, but she was barely interested in it at all. In fact, she walked away and played with a pom pom instead. This is the first time I’ve felt like maybe Holly is “over” this behavior issue. That’s a nutty thing to say, considering this cat constantly throws me curve balls, but in my heart it feels like maybe she’s okay now. Of course I’m going to to upstairs to check on Holly and she will have peed everywhere, right? It’s only been 4 days since the triple-pee storm, but it’s been one week that Holly’s been on Prozac. I think that perhaps Holly was fighting the effects of the Prozac so that's why she got so bad on day 3 and by day 4, the Prozac had "taken over" and begun working. The Kelloggs are on the road with Stephen. They come home in a day or two. Perhaps Stephen will come see Holly. I know that all these weeks away from her makes him more reluctant to come back. It’s easier to let her go if the connection is fading, but with this promising news maybe I can get him to give her one more chance? ©2017 Robin AF Olson. Come on Holly-girl! In my journal I wrote, “Come on Holly! You can DO THIS!” And I hope, pray, and cross my fingers and toes, that maybe we finally found the answer to help Holly keep her home. Annie and Andy’s (A&A) possible adopter was willing to wait a few weeks, while Holly stayed with us. It also gave me a few more weeks with A&A, who YES, I love way too much (if there is such a thing as too much) and who I'm reluctant to adopt to anyone. The Kellogg ladies did come visit. I offered to take them over to Wildflour Confections and Tickled Pink, which I consider to be a perfect girlie-afternoon adventure. They were in agreement because really, cupcakes and cute girlie things to buy? What is better? ©2017 Robin AF Olson. Tickled Pink. We began with a visit with Holly, breaking up the large family into smaller groups of two so Holly wouldn’t get overwhelmed. Greta and Sophia and I were having fun with the kitties while Kirsten, Noelle and Adaline were with Sam in the living room. Holly was playing fetch with her pom poms and all was well. After a while we switched things up. Greta and Noelle were downstairs with Kirsten and Sam while I was with the older girls and Holly. Suddenly I heard a tremendous crash from downstairs. I could not, for the life of me, even guess what the sound was, other than breaking glass, a lot of glass. I ran downstairs to find the 1950s glass topped table that’s in the room by the front door, turned onto its side with everything that was once on it in pile on the floor. Pressed up against the wall was Greta, terrified, not saying a word, not admitting she tipped the table over while her mom had gone outside to get something from the car. There is no other explanation and somehow I had to bite my tongue and not flip out as I carefully picked through the things on the floor to assess the damage. Kirsten was immediately apologetic and confused-as we all were. If I had thought there’d be a risk of the table being turned over I would have taken precautions. Luckily, the table was ok, but one glass piece, not a valuable one, was destroyed. Later I discovered my kitschy bowling ball decanter that had a music box in the base, was also broken. That would be tough to repair and I knew everyone felt terrible and Kirsten wanted to make it right. I get it, things like this can happen. It’s only stuff and no one got hurt. I was afraid that our afternoon trip would be cancelled, but thankfully we agreed to move past it and focus on having fun. Kirsten got everyone into their 8-seater van so we could travel together. She has so much energy and is so bubbly, I don’t know how she does it. My guess is she goes to bed at 7PM because it has got to be a tremendous amount of work to just stay present and pay attention to four children, let alone care for them and keep them all safe. ©2017 Robin AF Olson. The lovely Kellogg ladies at Tea with Tracy. We had a very lively conversation during our drive. The girls mostly occupied themselves and, once again, I was impressed by how quiet they were. ©2017 Robin AF Olson. STRAWBERRY. POPTART. CUPCAKES. I urged Kirsten to head for the cupcakes first because I was worried they’d run out since it was a bit later in the afternoon by the time we arrived (full disclosure: I NEEDED A CUPCAKE). The girls had fun choosing cupcakes and though I had every intention of only getting 4 cupcakes (to share with Sam), somehow I got 6 (thank you to Kirsten for buying them for us!). After getting cupcakes, we decided to try to have high tea down the street at Tea with Tracy. On a Saturday afternoon, the odds were not so good we’d get a table. The owner was very nice to us even though he was booked up he said if we could order and be done in 30 minutes he could seat us. We took on the challenge and had the fastest tea in history. We didn’t even finish so cups of tea were transferred to “to go” cups and the food was boxed up. No one complained. Everyone did their part and had as much fun as they could, promising they would do it again when they could make a reservation ahead of time. I was sorry we couldn’t have stayed longer, but it was nice to be part of a family for a time. ©2017 Robin AF Olson. 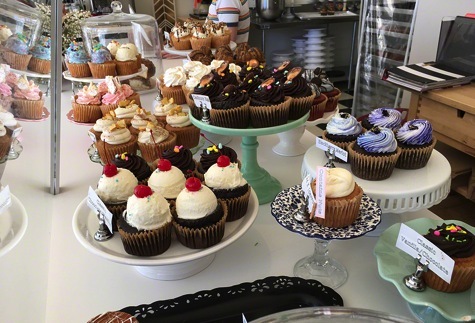 Wildflour Confections. Our last stop was Tickled Pink, mecca for girlie-gifts. As we walked around the shop, the girls were allowed to choose one modest gift for themselves. We broke into smaller groups pointing out things we liked. Little Greta chose a stuffed white kitten toy and clung to it as we continued looking at the displays of adorable giftware. She saw some hair combs that looked like a tiara. She tried to put one onto the kitten’s head. 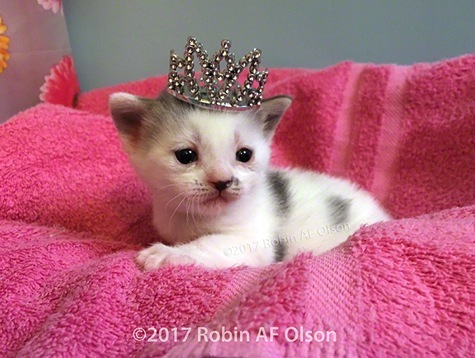 It kind of shocked me because a few weeks before I had done the same thing to a real kitten (I didn’t use the comb part on the kitten, just placed the tiara-comb on her head). I showed the girls the photo and we were all amazed by the synchronicity. ©2017 Robin AF Olson. Princess Willoughby. I think we all enjoyed our time together. Kirsten congratulated me for surviving the day with the girls, but in truth I enjoyed myself. I haven’t been around children much, other than my nephew and he’s going to be 24 soon. I find that I like kids a lot. Maybe it’s because I still feel like one inside. I kept in touch with Stephen, updating him on Holly's progress. He sent her some video messages to keep her company, assuring her he still cared about her. The problem was I was the human on the other side of the messages and in a lot of ways the messages felt like they was directed to me, even though rationally I knew they were not. My God this man can make a person swoon, no doubt there. With his permission, this is what he sent Holly [see below] (and by the way, Holly heard his voice and pawed at my phone, then meowed, so his swoon-powers work on cats, too). So things moved along. Holly began to settle down. I wondered if she’d start to pee on the bed once she felt safe in the room and if she began to bond with me. I began looking for a kitty-buddy for Holly since the Kellogg’s decided adding Annie and Andy would be too much to take on. I wasn’t surprised at all, but it would have been the easiest transition for the cats. ©2017 Stephen Kellogg. Used with permission. Holly-girl, Stephen's special nickname, along with the special message that made Holly swoon, too. I found a possible cat-candidate with my friend Katherine who runs AID. He was the right age, mellow cat, who liked being with other cats. I trust Katherine and knew she would back him up if it didn’t work out. The Kelloggs were anxious about getting a second cat and looking forward to adding to their family. They knew I had to offer them a cat so I could carefully assess them up front to give them every chance of making a good match. I wish I had a cat that could be a solo cat but none of my fosters fit the bill. I also realized I needed to push Holly a bit to see if she would react inappropriately, so two nights ago I didn’t clean the litter pan before going to bed. That day I hadn’t spent much time with the cats because two of my own cats, Spencer and Nora, had health emergencies. I was also trying to wean Willoughby and Weatherby off their mom, Waverly, and onto cat food. I was tired and stressed out. Annie, Andy, Mia and Holly only got the basics that day. The next morning, Holly peed on the bed…on MY side of the bed where I spend my time hanging out with the cats. I was pretty shocked and saddened to see the large stain on the sheet. Thankfully I had prepared the bed beforehand using a waterproof mattress pad, topped with a shower curtain, topped with puppy pads, THEN covered with a fitted sheet. The urine was mostly absorbed by the pads, but one pillow did get a bit wet so I did a few loads of laundry. ©2017 Robin AF Olson. Heartbreak comes in the form of a puddle of urine exactly where I sat each night with Holly. I thought about what this means for Holly. It could mean she will lose her home. I have to talk to Stephen about it, but I want to have more data points before I tell him. Sam and I spent yesterday (Saturday) afternoon with Holly and the kitties. Their pans are cleaned three times a day. I made sure Holly got a snack so she wouldn’t be stressed from being hungry. Right before bed I cleaned out the pan again. ©2017 Robin AF Olson. Being prepared made a big difference. There was no way any urine was going to get on the mattress with a shower curtain under these puppy pads. This morning the bed was dry. I got up early to make sure it was ok. I scooped the pans, then went downstairs to get the cat’s food. About an hour later I served breakfast. 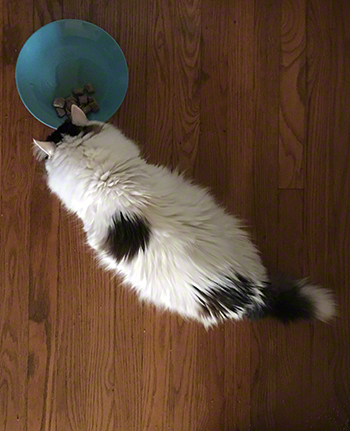 Everyone ate well, then started using the litter pans so I scooped them since I was there. While I was scooping, I heard a noise on the bed. Holly was sniffing the area where she’d peed the day before and was furiously pawing at the area. I responded by making a short loud hiss-like sound at her. 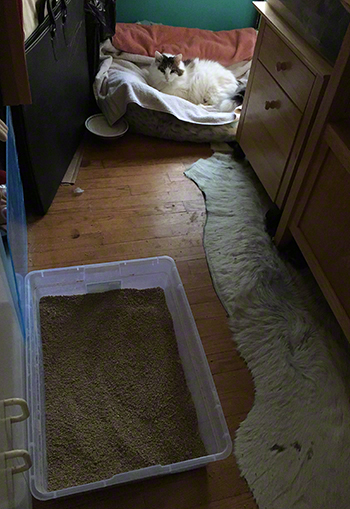 She stopped, jumped off the bed and into the litter pan and peed. ©2017 Robin AF Olson. Whew. I didn’t know if she was reacting to a urine smell that I didn’t clean well enough or if she was energized by my being there a few times so early in the morning and by just eating. She corrected her behavior immediately once I hissed, but what was the bigger meaning here? Was she stressed from me being gone the day before and wanting to have her scent mix with mine? Was she just having an “oops” moment that needed a quick correction? What I knew I couldn’t tell Stephen was definitively what we had to do for Holly. I couldn’t guarantee anything would work. In my own home I still deal with inappropriate elimination issues because I have 8 cats. It’s not bad compared to how it was years ago, but if I’m not careful there are still things that can trigger a cat to pee somewhere they shouldn’t. Could the Kelloggs still love Holly if they knew they’d have to clean up after her from time to time? Maybe she would grow out of it. She'd gone TWO WEEKS without one misstep. I know she can do it and maybe in a few more months she will be using her box all the time? The problem is, I can’t know how she will behave. I can put her on anti-anxiety meds, but she is only 7-months old. I’m going to talk to Dr. Larry tomorrow and I’m going to work up the courage to talk to Stephen. He’s only on the road for another week so my time is running out. I’m afraid Holly’s is, too.